Queen of England in a parade celebrating her birthday. HERE. Three Ladies Go Traveling spent four days in London seeing the sights. A trip I will never forget as long as I live. It was just fabulous. 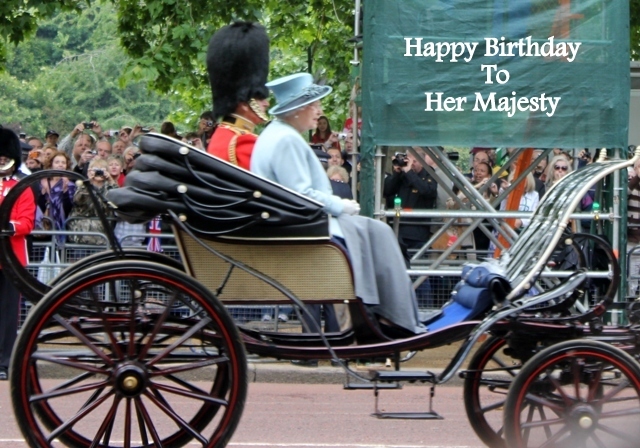 This year the Queen's birthday celebration is scheduled to be held on Saturday, June 16, 2012. I hope to be watching. As some of you know my mother is English. And her parents landed in America in 1914. I wanted to do a tribute to the Queen's Birthday with a Blue and White Tablescape. The British love Blue and White. The teapot napkin rings I found at the thrift store. I don't know if they are vintage or not. But, they are sure cute. The Goodwill just opened a store in our community in March. The first week they were open was heaven. limited trademark on the back What a deal. The butter dishes I bought at TM. Perfect for each person to have their own butter dish. Strawberry jam and Whipped cream is ready to lather over the warm buttered scones. A butter knife in the pattern of 'First Love' and each place setting has a small salt and pepper shaker. Hot tea was served in individual tea pots. I brought them home too. I found a Union Jack Tea Towel in London and packed it away to use for this occasion. My two wonderful traveling comrades. The patriotic Red, White and Blue in the Flags. Buckingham Palace after viewing the 'Trooping The Color' with Prince Philip sitting by her side. of us carrying the Union Jack flag in our backpacks. After the parade we walked to the palace and then walked to a nearby park and had a picnic lunch. Oh how lovely - this represents a lot of work and everything looks so wonderful! Betty, I love your tablescape. What a lovely tea to celebrate Queen Elizabeth; what a wonderful trip you and your friends shared! I love this beautiful tea in honor of the Queen. What a lovely tablescape! I am, like you a first generation from a Brit family and I married a Brit...so the Jubilee was a big deal at our home. I so love your photos! What fun! Love your post! BASICALLY BRITISH - hope you visit www.finchrest.com so I can share it with you! What a wonderful tea you hosted to honour HRH's birthday. I imagine there will be special things this year with it being her jubilee. Betty, your tea table is simply splendid and thank you for sharing your memories of your trip. I love all things English too. Your china is so pretty and I love the little butter dishes; so cute! Beautiful bouquet too! Thank you for sharing this with us and joining me for tea. Enjoy your week. 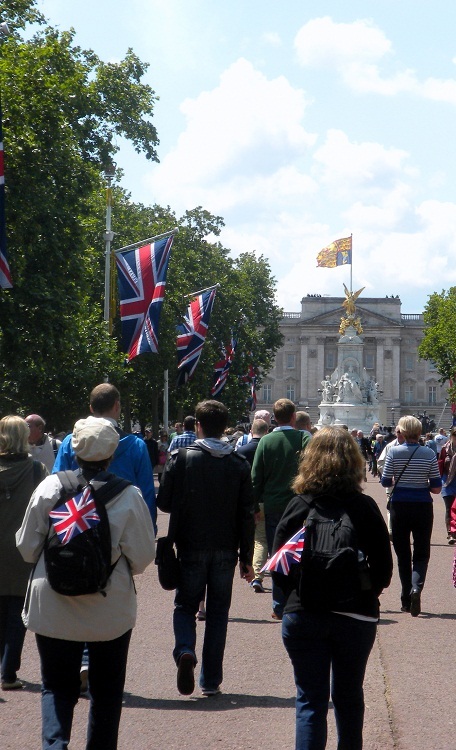 How exciting for you to see the Queen last year on her birthday, and with all the festivities surrounding! I would so dearly love to have such an experience, being a major Anglophile myself. Your tea setting is lovely. Have a great day! Hello Betty, I am so thrilled for you that you were able to be there in person and see the Queen! And your celebrations table is beautiful. I love how you set it, and your desserts look really delicious. I think your two friends are delighted! How fun to celebrate with friends! Love your tablescape to honor the Queen! What a great find on those pretty blue & white dishes from GW. I adore the napkin rings. I need to go back and see where they're from. The menu sounded fab!! Beautiful post! I love your GW dishes and I'm truly loving those napkin rings!! Very nice tribute to the Queen. Have a wonderful night! 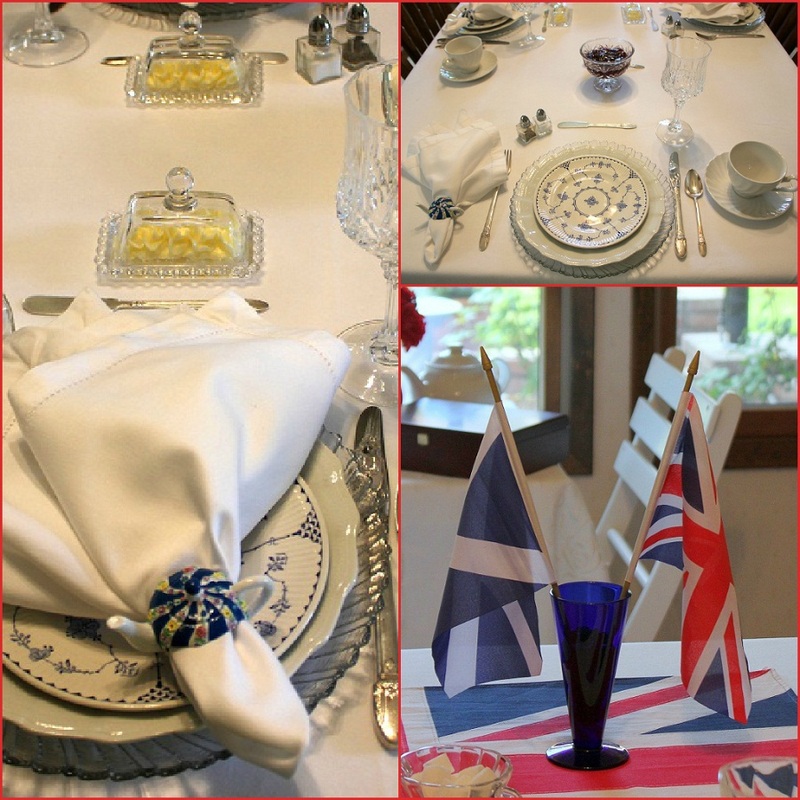 Such a beautiful tablescape and what a wonderful way to show your love for the English culture. Love it! I'm a New Follower. It looks perfect for the Queen. I love the little teapot napkin rings the most of all. They're cute and keep right to the British theme. It must have been wonderful to visit London during her birthday and get that marvelous shot. My sister and her best friend just returned from a trip to London. They were about a week ahead of the Jubilee celebration. Wonderful tribute to the Queen! How fun to have two traveling companions! How sweet to honor your heritage by celebrating the Queen's birthday. What a pretty way to celebrate the Queen's birthday! Love it and I too love England and Scotland! Lovely! I loved visiting England. My grandmother was English......Thank you for sharing such a delighful post.